In this lesson, you are going to create a design for a music store ad, using existing snippets and a template, so you get the feel of the basic functionality of the Cacidi LiveMerge panel. 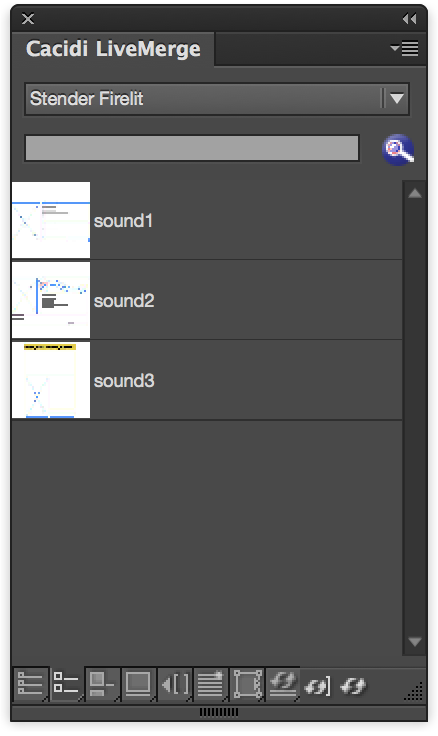 If you’re already familiar with our Adobe InDesign plug-ins you will notice the new drag n’ drop functionality. If you can’t see the Cacidi LiveMerge panel, go to the Adobe InDesign “Window” menu, and make sure you have a checkmark next to the Cacidi LiveMerge panel. Go to the Cacidi LiveMerge palette fly-out menu and select the 14-Music project setting. All necessary settings for this project at set for you, data and design vice. 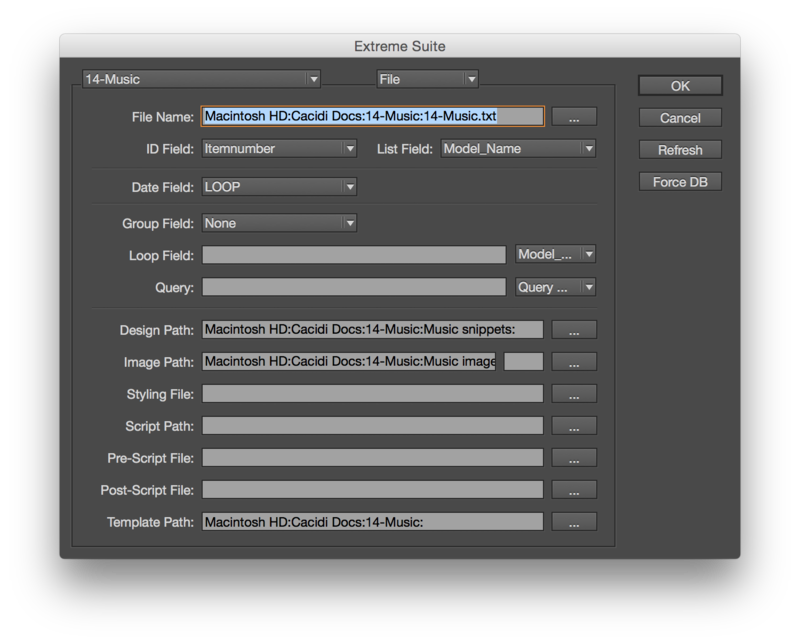 Open the file “Music.indd” from your normal InDesign file menu (provided in the ”14-Music” folder of the ”Tutorial” folder). This file is just a normal InDesign document containing some graphics for the background of the music store add we are going to make. When you’ve opened the file, click the four icons in the bottom of the Cacidi LiveMerge palette and notice that the viewing of the snippets are changing. Select the second icon from the left. For this plug-in we added the functionality of drag n’ drop to make your LiveMerge experience more fluent and seamless. Try this added functionality by selecting a record of your choice in the drop-down menu and then drag n’ drop the snippet sound to the template. The record’s information has now been merged according to the placement of the merge fields of the chosen snippet. Now drag n’ drop the snippet Sound to your work space while pressing down the alt button. Only a few merge fields have been inserted in this snippet, you will insert the rest. Using Adobe InDesign’s built in texttool make a text box between the headline and the ”Description” text box. to view the field headings list. Making sure your cursor is placed somewhere in the text box, select “colors” in the field headings list. Observe how brackets are used to designate the merge fields as dynamic text that will later be replaced with data from your SQL database. 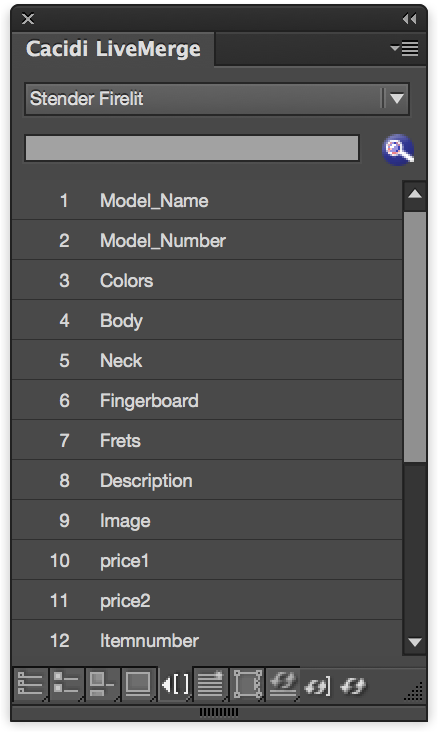 Now press enter and add ”Body”, ”Neck”, ”Fingerboard” and ”Frets” to the list. Select everything you want to save as an snippet and simply drag n’ drop the design to your LiveMerge Panel. A Save file dialog will pop up and ask you where to save the snippet. Save your snippet as Sound. Remember only to save your snippet when working with merge fields, NOT when viewing record information. Delete the snippet you just make from the InDesign document, choose a record of your choice from the drop-down menu, and then drag n’ drop the snippet sound to the InDesign document anew. You will now see the snippet you just made with the data from the database for the given record, instead of just the mergefields. Spend a little time choosing different records and pairing them with different snippets to experience the added functionlity of drag n’ drop and to get familiar with the plug-in. Notice how the different snippets are designed using Adobe InDe- sign’s built-in tools, for example as illustrated in snippet sound where we inserted mergefields on a path using InDesign’s “text on a path” function. I’m struggling to understand how the Live merge plugin works. The documentation I can find is horrible…there are a lot of “image placeholders” and no images. The Music tutorial files mentioned here are not in my version of Live Merge (Adobe CC). Frustrating. I can’t tell if this software is a potential solution to my instruction booklet problem because I can’t evaluate it properly. Are you using a native Excel file or a tab/comma/csv file?, can you send me the file so I can investigate it?